The Hidden Gem of Vermont. Nestled on the backside of Okemo mountain this newly renovated cozy cabin is the perfect place. Hot tub just added for winter 2017/2018!! New kitchen, bath, floors and more were completed this summer. Situated down off the main road on a small pond with a large yard for sledding and outdoor fun. Easy access to Okemo (6 miles), Jackson Gore (4 miles) and Killington (22 miles). Ice skating, snow shoeing, snowmobiling, snow tubing and other winter activities are at your doorstep. The town of Ludlow is less than 10 minutes down the road with great restaurants, bars, and shopping. Great retreat for families and friends. Features high speed WiFi & cable television. Loft has one queen bed, one full bed, and two twin beds. Living room also has a pull out sofa. Sleeps six - eight comfortably. Landline with unlimited nationwide calling. Plenty of parking in driveway for several cars and snowsled trailers. Common spices and cooking basics. Basic Cable with sports, local, and weather channels. Cards Against Humanity, Playing Cards, Sorry, CandyLand, UNO. Large Yard Pond is not suitable for swimming. Thought there was one bedroom from photos. It was one large open loft but had low ceilings. Steep steps to loft - the only door in the place was the bathroom. Don’t get me wrong - it was clean and lovely. Private and the hot tub was amazing. We had an amazing time! It was the perfect weekend getaway with a hot tub and great accommodations. We enjoyed our stay very much! Our family of 5 had a wonderful stay in this quiet, cozy cabin just a 5 minute drive from Jackson Gore, where we skied over 4 days. The cabin is clean, well taken care of, and had all of the essentials that we needed to make our stay easy. The owner has it nicely furnished and decorated and the loft area was very comfortable for sleeping. Our 3 young kids absolutely loved it and so did we. Just a warning that the stairs are a little steep to the loft upstairs and that could be an issue for families with young children. Some sort of gate at the top of the stairs would be useful- we actually used the ironing board & some pillows to block the stairs at night just in case one of the kids woke up and took a wrong step. This cabin is really special and we hope to be back again! Perfect cottage for a perfect ski weekend! Cozy Hideaway was perfect for our needs. My wife couldn't make the trip, so it was my two 13 year old kids and one of their friends, and me. The house meet all our needs. It had fast internet and a great hot tub. 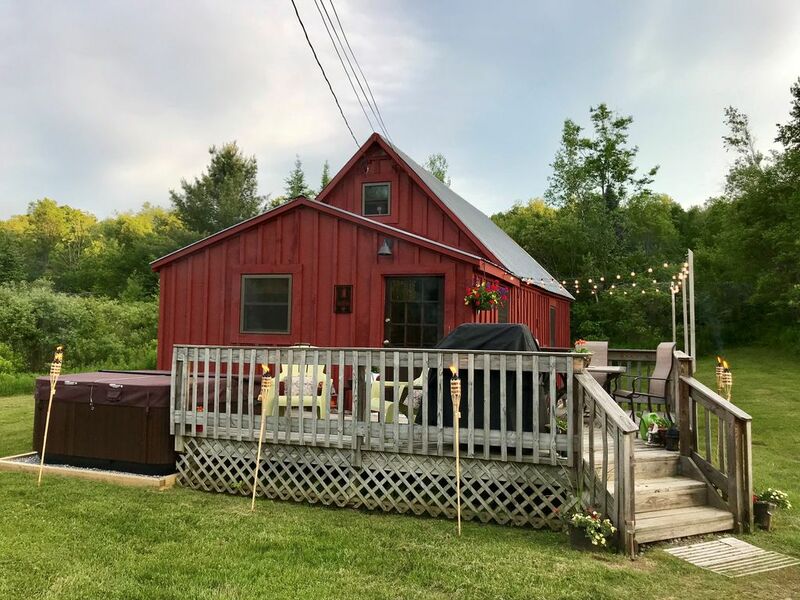 It was super clean and comfortable, well stocked with supplies for cooking / cleaning, and best of all, it was conveniently located close to the Okemo and all the action in Ludlow. Christopher, the owner, quickly responded to a question I had, and communication was fast and easy. Everything was perfectly set up and ready for a cozy cabin weekend. We loved everything! The Hideaway was perfect for a Vermont weekend getaway. The close proximity to Okemo was great, and all that we needed was there in the cabin. The cabin was clean, neat and stocked with all the essentials we needed. Having access to the hot tub is the way we will be able to get through the rest of winter. Thank you so much for opening your home to us, we loved it.